Monday (Memorial Day) Jay and some other friends threw on one hell of a party/barbecue. The beer and other types of liquor was a flowing. It was quite the great time getting together with friends. Well, I got a call today a little after noon from my brother telling me I had to go down to the car shop. 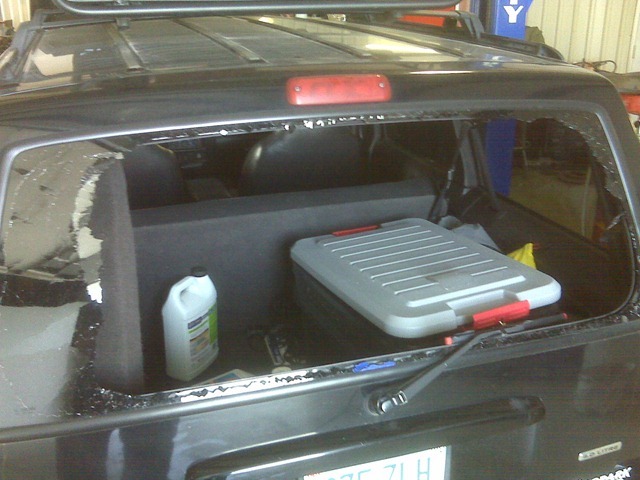 It appears someone broke into my jeep (Though they are not really sure when .. might have been Tuesday). The Jeep had been parked outside a local mechanic shop waiting for a newer engine to be put in it. When they went to pull it in today to pull the bad engine out of it they had noticed the back window had been broke out. I had to go down and talk to the police officer and give a report. They had ran off with my tripod, tools, and who knows what else. I really didn’t have much in there because I am always afraid of it getting broken into. But they still did it. I wonder how much this window is going to cost. I also wonder if my bad luck will continue. Hopefully it doesn’t continue into next week when I have to go in and meet the bosses to discuss the future of the company. I would sure hate to be without a job like other people i know.